The obverse of the coin features: a fragment of a miniature from the Constantine Manasses’ Chronicle – Khan Krum drinks a toast to the Slavic rulers; the logo of the Bulgarian National Bank with the year ‘1879’ inscribed on the ribbon; the nominal value of the coin ‘10 ЛЕВА’ (BGN 10), and the year of issue ‘2011’. 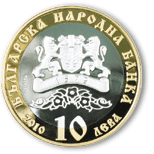 The text ‘БЪЛГАРСКА НАРОДНА БАНКА’ (BULGARIAN NATIONAL BANK) goes in circumference on the outer ring. The inner circle on the reverse of the coin features a fragment of a miniature from Constantine Manasses’ Chronicle – Khan Krum pursuing the Byzantines. Written in circumference on the outer ring are ‘СРЕДНОВЕКОВНИ БЪЛГАРСКИ ВЛАДЕТЕЛИ’ (MEDIEVAL BULGARIAN RULERS) and ‘ХАН КРУМ’ (KHAN KRUM).